How Do You Add Two Negative Numbers? Adding two negative numbers together? Just add the absolute value of each number together, put a negative sign in front, and you have your answer! See how it's done in this tutorial. 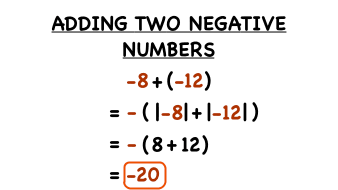 What are Positive and Negative Numbers? Positive and negative numbers (and zero!) are the building blocks of math. This tutorial will introduce you to positive and negative numbers and show you their location on a number line. Plus, learn a special thing about the number zero! How Do You Subtract a Positive Number from a Negative Number? Subtracting a positive from a negative? Just remember: subtracting a positive is the same as adding a negative. See how it works in this tutorial!